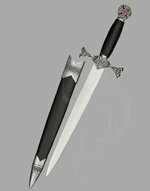 Customize this Dagger with Optional Engraving! Awesome Groomsmen and Award Gifts! The Templars were the "special forces" of the medieval world. They were feared and revered (and, eventually, smeared, but that's another story). This Templar dagger recalls the knights of old, and the new Templar and Masonic orders popular today. 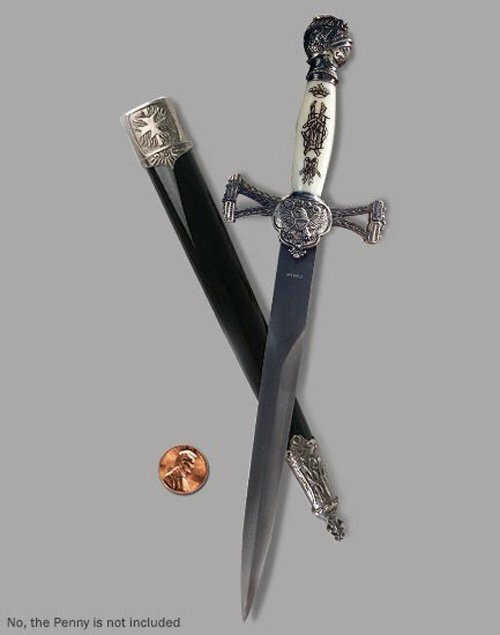 This stylish dagger is slightly smaller than our other daggers in this range, but its beauty is unmatched. 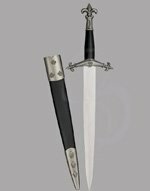 A gorgeous white grip is etched with the Symbol of the Templars (and Masons) (and Hospitallers) (And, Huguenots). BR> These are extremely popular groomsmen's gifts and wedding gifts (add one or two lines of custom engraving for just $10). 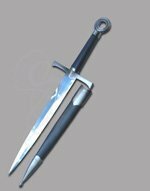 Also great for knighting ceremonies and the zombie apocalypse. They called and asked how I wanted my engraving set up to maximize awesomeness. My two groomsmen loved them as gifts. Great value in the finished product to the price. Very beautiful and accurate. 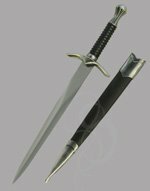 Did not know what to expect but now I want to collect more blades from Strongblade.